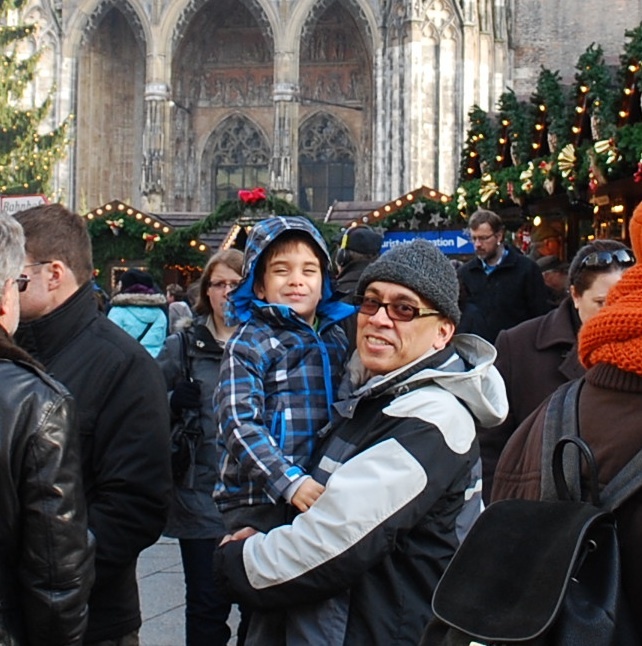 Christmas in Bavaria is very familiar to American Christmas, yet the focus is slightly different. We are delighting in the sights, sounds, and smells that we encounter at every outing. The holiday season still abounds with commercial marketing ploys, yet it also seems easier to focus on the other aspects of the season, such as traditional family foods, gathering together with friends, and reflecting on one’s religious beliefs and charitable aspirations. 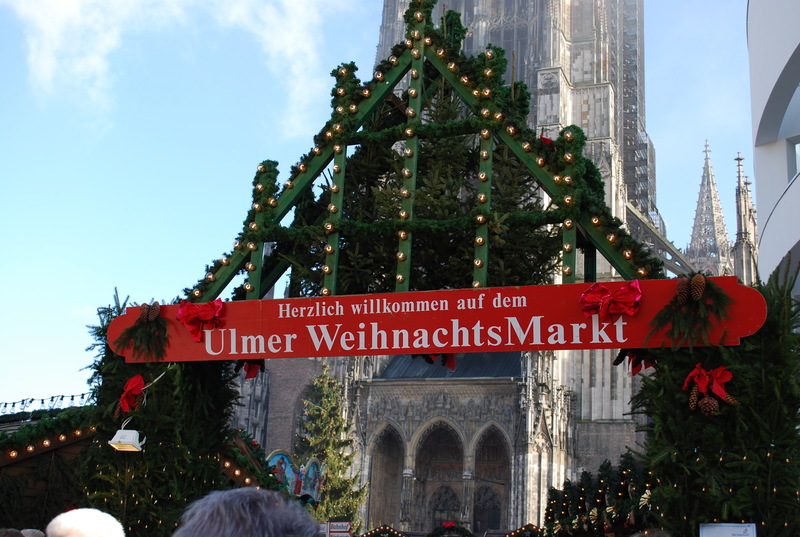 Central to each large town in southern Germany is the Christmas market. Many tourists come each year to tour through all of the various cities, but with our two young kids in tow we only managed to visit the one in our hometown. The town square (the Münsterplatz, in our case) gets taken over with wooden stalls which sell decorations, gifts, and delicious food. After dark, it’s especially magical, with holiday lights twinkling everywhere. 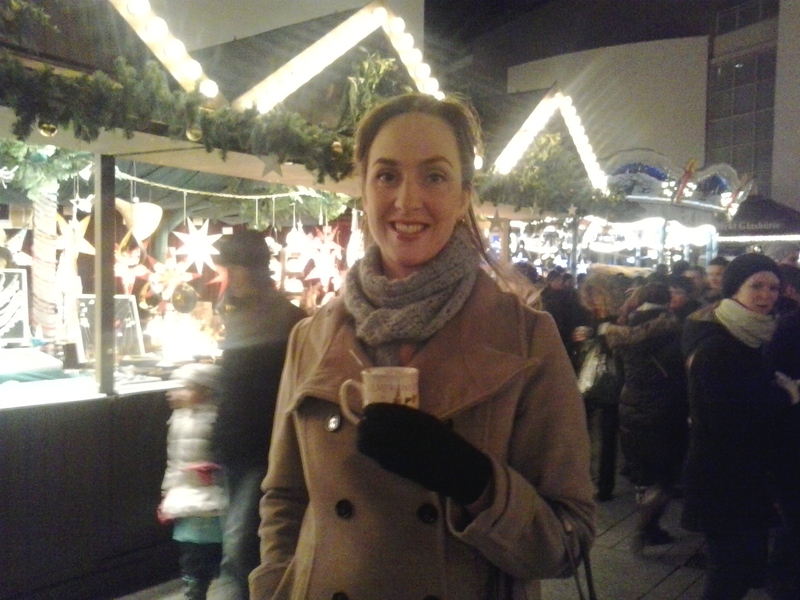 And a mug of delicious Glühwein (mulled wine) or Feuerzangenbowle always helps to ward off the cold and uplift one’s Christmas spirit. By daylight, there are plenty of fun carnival rides and activities to keep the kids entertained. They had miniature scenes from many Germanic fairy tales and legends. 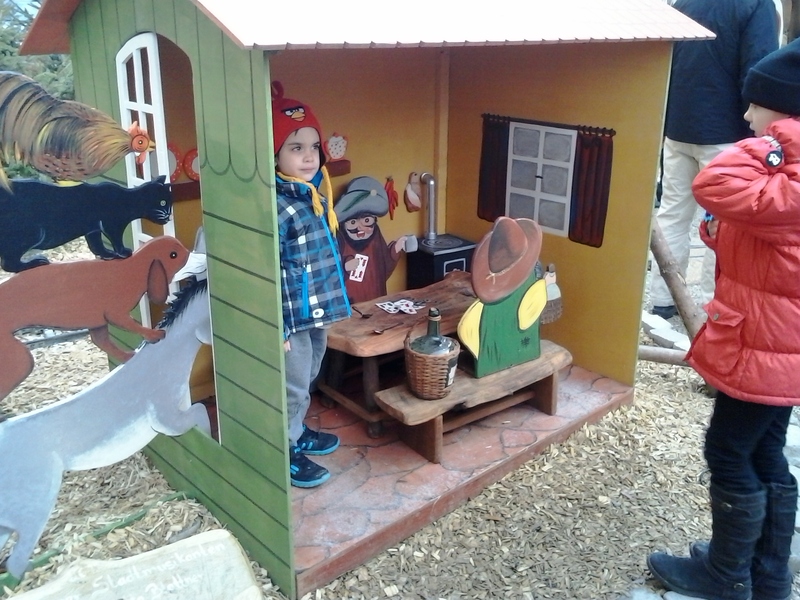 Above, Sam is standing inside a set of the “Bremen Town Musicians”. 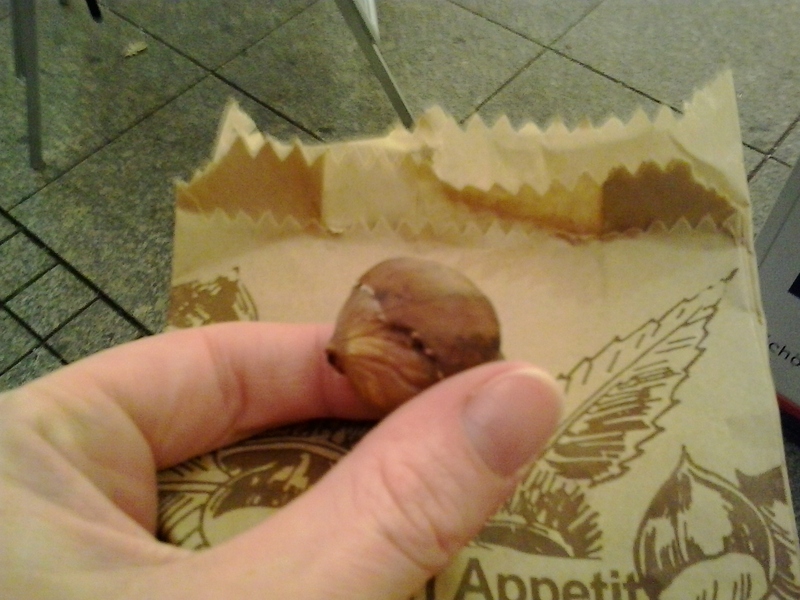 I even got to try my first taste of “chestnuts roast[ed] on an open fire” (heisse Maroni auf Deutsch). We also tasted lots of sausages, schupfnudeln (large noodles with sauerkraut and bacon), candied nuts, and apple fritters. 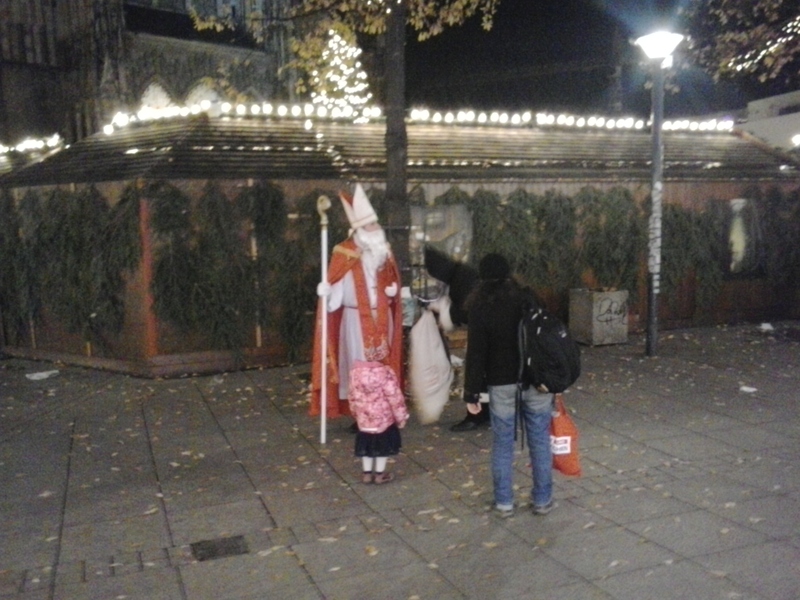 On December 6th (der Nikolaustag), I even spotted St. Nicholas. My apologies for the lack of photography skills. But you can just make out his helper, Knecht Ruprecht, dressed in black and holding the back of goodies. Legend has it that Sankt Nikolaus brings the good children apples, nuts, mandarins, and chocolates, while Knecht Ruprecht gives the bad children a spanking and a lump of coal. Supposedly, there are also appearances by Krampus on December 5th, but I didn’t make it to the market on that day to check. My kids may be naughty at times, but at least they don’t have to worry about visits from such scary creatures! Check out this mistletoe! I’ve never seen more than a sprig before. And watch for the last two riders on the train! Happy holidays to all our dear family and friends! We may be separated by many miles, but you are always in our thoughts. This entry was tagged Food, Holidays, Shopping. Bookmark the permalink. I didn’t see the train video until I opened the comment screen. When I tried to replay it, I found instead a collage of short YouTube videos of Christmas market scenes, mostly in Paris. Might be an Apple/Windows thing…I’ll work on it. Thanks for the feedback. Wonderful images & words to remind us of the meaning of Christmas. Beautiful; thanks for sharing! 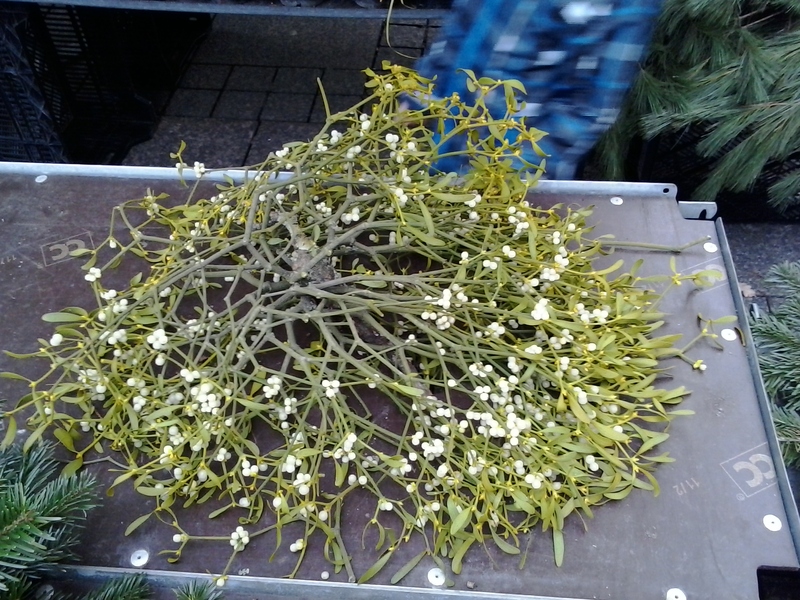 That mistletoe is gorgeous!! Hi Betsy! I just nominated you for the Shine On Award.